Every season we like to spruce up El Palmar Beach & Tennis Resort with a few new items, some years it's new bedding, others it's new dishes, this year we headed to one of the Mexican handicraft mecca's, Tonala, and purchased some new ceramics for the rooms and garden. Tonala is a suburb of Guadalajara about 4 hours from Melaque. It's a shoppers paradise, everything you'd find in Pottery Barn or Pier One, you'll find in Tonala at a 1/4 of the cost. The Fishing is Great in Melaque Mexico! A couple of weeks ago Rosie and I took the kids out for a fishing trip. We left Melaque early in the morning and headed out to bag a few fish. It was a beautiful morning on the Pacific Coast, we had heard of a few whale sightings so we looked out to the horizon searching for the telltale signs of whales. No whales this morning but lots of fish. 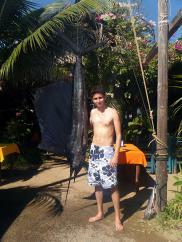 We brought in two Dorados and a 50 kilo (100lb) Sailfish! Read more about The Fishing is Great in Melaque Mexico! My wife was thrilled with the beautiful accommodation.